I get homework from my lovely friend Fitta and Syantie to post my favorite food. I love to cook and I love to eat Indonesia food, but since I lived in Australia since 10 years ago, I would like to post about famous Australian dessert, Pavlova. In 1935, the chef of the Hotel Esplanade in Perth, Western Australia, Herbert Sachse, created the pavlova to celebrate the visit of the great Russian ballerina, Anna Pavlova. Whilst it has been suggested this dessert was created in New Zealand, it has become recognized as a popular Australian dish. I made Lapis Surabaya last week, and I didn't use the white eggs for that cake. 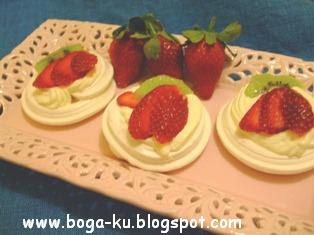 So, I think its the right time to make Pavlova as our favourite food. Lightly grease oven tray, line with baking paper or use non-stick cooking spray. Beat the whites of eggs with a pinch of salt until stiff (until peaks form). Continue beating, gradually adding sugar, vinegar and vanilla, until of thick consistency. Pile mixture into circular shape, making hollow in centre for filling. I made mini pavlova since my family like the small pavlova. Electric oven: turn oven to 250F (130C) and bake undisturbed for 1 1/2 hours. Gas oven: bake at 400F (200C) for ten minutes, then turn oven to 250F (130C) and bake a further hour. Turn oven off, leave pavlova in oven until cool. 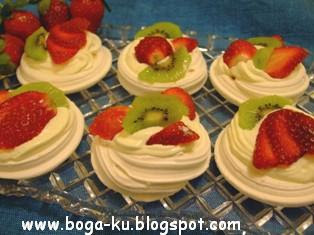 Top with whipped cream and decorate with fruit as desired. Mybabybay loves Asam Laksa from Penang, Malaysia,JustMyThoughts loves Penang Char Koay Teow,My Lil Venture loves Laksa Sarawak, Monterssorimum loves Teluk Intan Chee Cheong Fun, Chinnee loves Melaka Wan Tan Mee, PeimunLeah loves Hakka Lei Cha, Hui Sia loves Crispy duck skin from China, Karen loves Pan Mee, Simple American loves Cheese Enchiladas, Nicole Tan loves Char Tau Kueh, velverse loves Otak-Otak, Giddy Tiger loves Dim Sum, may loves Roti Bakar, Selba loves Gado-gado, Chen loves Satay*, eastcoastlife loves Shanghai Buns, Kev loves 蕃薯旦, Bokjae loves Ipoh Sar Hor Fun, Cooking Momster loves Penang Heah Koh & Chee Cheong Fun, Blur Mommy loves Clam Chowder, Granmother Stories loves everything, East Meets West Kitchen loves Good Dim Sum, Little Corner of Mine loves Nasi Lemak & Penang Assam Laksa, Paknesia Food loves Rendang, Food is Love loves Tumis Kangkung, My Sweet Kitchen loves Tumis Tempe Cabe Ijo, Diajar-Masak loves Soto Bandung, Haramain's kitchen Pavlova. 0727jejeComme les nike air jordan 1 retro mid nouveau anthracite magasins, achetez un film de new balance 999 beige et bleu rétrécissement pour couvrir les asics gel lyte v prix chaussures, pour s'assurer qu'il nike air max thea prm camel ne sera pas oxydé new balance pas cher junior de l'air. C'est vraiment nike air huarache pas cher blanche ce petit ajustement qui air jordan future camo a contribué à le air jordan femme shoppy discount propulser à de grandes hauteurs.